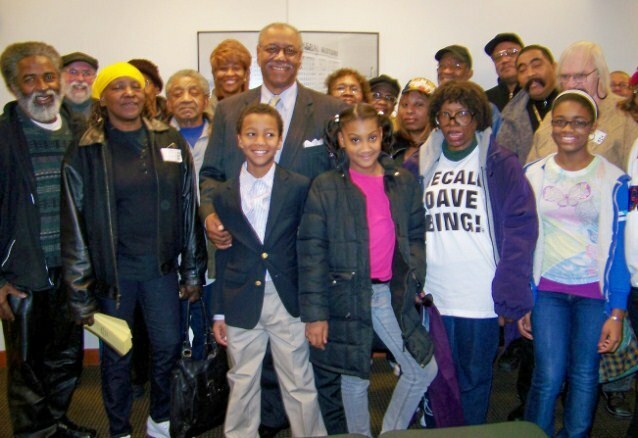 DGRS SELLS OUT; RETIREES, BARROW SAY ‘VOTE NO’ ON DETROIT BANKRUPTCY PLAN! Download copy of flier above at Vote No flier. THE NEXT DGRS MEETING IS SET FOR THURS. JUNE 12, 2014 FROM 6 PM TO 8 PM AT RENAISSANCE UNITY CHURCH, 11200 E. ELEVEN MILE RD, WARREN, MI. WITH THE SAME FORMAT EXPECTED. RISE UP RETIREES! DO NOT LET YOUR ELECTED TRUSTEES SELL YOU OUT!!! DO NOT BE SILENCED AT THE NEXT MEETING! 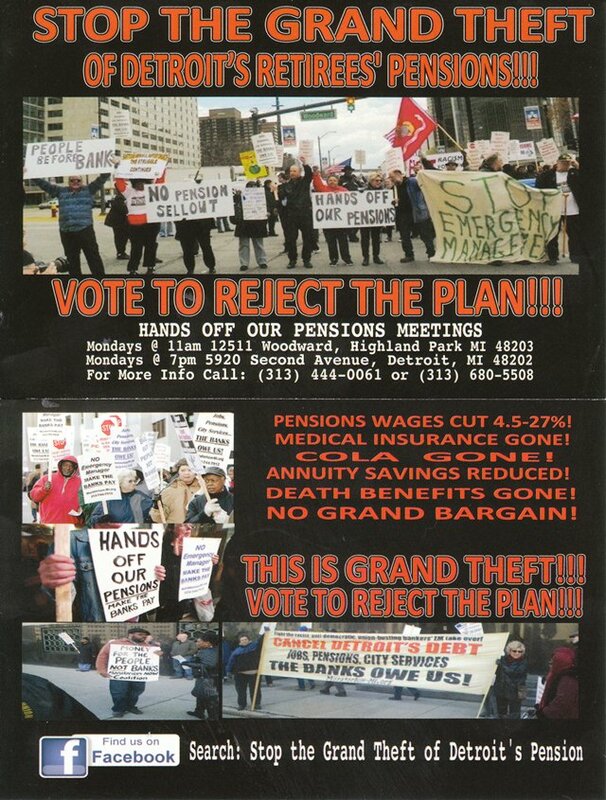 DETROIT — Please be informed, that several retirees and citizens attended the Pension Board Benefits Committee Meeting yesterday, May 28, 2014. 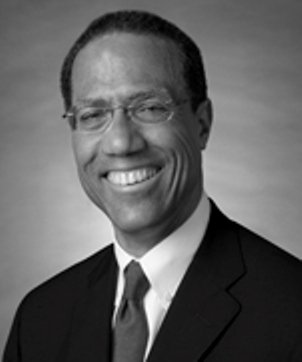 Attorney Claude Montgomery of the Denton Law Firm presented a very vague presentation (2-3 pages) of a Volunteer Employee Benefits Agreement (VEBA) to the Board and requested 5.5 million dollars for the VEBA. This request was made last week also, without the professionalism or respect of any written materials. However, the board did not vote or endorse last week. The board voted 3-2 to give the US Bankruptcy Court-appointed board (see attached order and membership below) $5.5 million (yeas Thomas Sheehan, Lou Hatty, Lori Cetlinskii-nays June Nickelberry and Tasha Cowan). The board benefits committee approved a motion requesting membership on the VEBA board, which was not tie barred to the $5.5 million. During the discussion trustee Hatty was concerned whether 5.5 million dollars was sufficient, particularly as it relates to prescription costs. (VOD note: The 4th Plan of Adjustment specifies clearly that only the Official Committee of Retirees (OCR), which Denton represents, and the Detroit Retired City Employees Association–DRCEA, led by Shirley Lightsey, will sit on the DGRS VEBA board. For the Police and Fire Retirement System, only the Official Committee of Retirees and the Detroit Police and Firefighters Association, led by Don Taylor, will sit on that board. This opportunity to make money off the VEBA’s, which are nothing but bank trusts which DO NOT GUARANTEE payment of ANY health benefits (as specified in the 4th Plan of Adjustment,) is clearly behind the DRCEA and DPFFA endorsements of the 4th Plan of Adjustment. Pension board trustees need to be knowledgeable of the 4th Plan of Adjustment specifically related to “other post employment benefits” OPEB and VEBA. It appears that they are endorsing privatization of our health care benefits and relinquishing oversight to an unknown and unproven authority. VEBA’s have only been used in the private sector and generally have expensive administration costs. This creates a new entity at our expense. The GRS and PFRS already have a historical knowledge base or access to expertise in providing benefits and could purchase a group health care plan via request for proposal. This court appointed retirees committee board has already endorsed the 4th Amendment to the Bankruptcy Plan of Adjustment and are used as an authority replacing our elected Pension Board. U.S. Bankrupty Judge steven Rhodes (3rd from left) approved the appointment of the Official Retirees Committee, which is now selling out retirees. 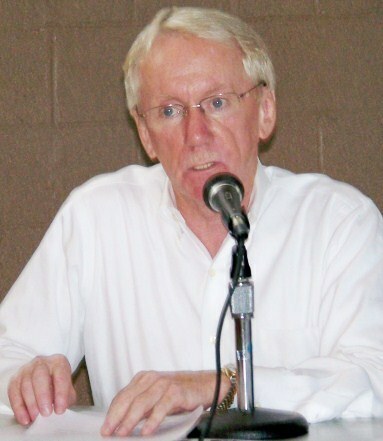 Here Rhodes is shown as chair of a “Municipal Distress Forum” held Oct. 10, 2012, with pro-EM and pro-Chapter 9 participants, Frederick Headen (state treasury) Edward Plawecki, EM trainers Douglas Bernstein and Judy ONeill, who helped co-author Public Act 4, and most glaringly, Charles Moore of Conway McKenzie, a chief witness for Kevyn Orr/Jones Day during the bankruptcy trial. Remember, this is the bankruptcy court-appointed retiree board (click on Court Appointed Retiree Committee letter) that voted (3 to 5-one member abstained) to eliminate health care benefits for retirees under 65 years of age and allocated a measly $125 dollars stipend for health care. 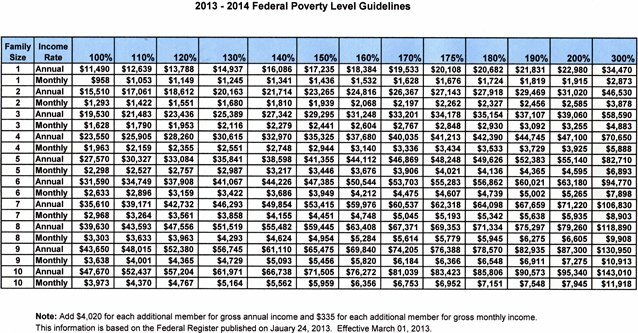 Retirees by design were forced to apply for the President’s Affordable Health Care Act plan, which is affordable up to about 130% of the Federal Poverty Level (see attachment) or $1245 monthly for an individual. Most retirees pensions are about $1583 monthly and now are paying between $300-600 monthly for health care benefits, not including prescriptions. NOTE: THE DETROIT BANKUPTCY PLAN USES 105% OF FEDERAL POVERTY LEVEL TO PROVIDE ADDITIONAL AID FOR RETIREES. EVEN CHURCHES GIVING OUT FREE FOOD USE 200% OF THE GUIDELINE! Please note that the Denton Law Firm represents the court appointed retiree committee, sounds like the fox may be in the hen house. The Denton Law firm is being paid for by the city via Bankruptcy Judge Steven Rhodes and the U.S. Trustee’s approval. The US court appointed committee has also been indemnified (held Harmless) against law suits for the decision they make and the members they represent. Pension Board Trustees must be held accountable for the decision that they make with our money. CALL THE TRUSTEES! VOD has located likely home phone numbers on People Smart for Trustees who voted for the $5.5 million, since the DGRS general number at 224-3362 has been swamped, and those answering it cannot respond to questions about the board members’ votes. Mayoral candidate Tom Barrow and supporters after hearing on his appeal of 2009 mayoral election results. STATEMENT ON THE GRAND BARGAIN–VOTE NO! A number of Detroit pensioners have asked me whether they should vote “Yes” or “No” on the so-called “Grand Bargain”. While I explained that I am not a city retiree, I also explained that my mother was and therefore I agreed to say what I believe would have been in my mom’s best interest. I begin by stating that I have read the voluminous 3″ thick document (no average senior citizen will likely ever read nor understand its complex legalese). I have also read the proposed ballot received to cast a vote. Having said that, I am convinced the “Grand Bargain” is not a bargain for retirees. It is a proposal which shifts the focus to the most vulnerable as if somehow they are responsible for the city’s phony malaise. The first glaring abnormality of the “Bargain” is that it requires retirees to waive essential constitutional rights to sue the State or City. This means that if current pending lawsuits surrounding the EM law are struck down, retirees will have consented to cut their own income and all of their generationally promised benefits. Why, because the pension is a state constitutional obligation. This alone should cause any retiree to question how grand the “Bargain” truly is. 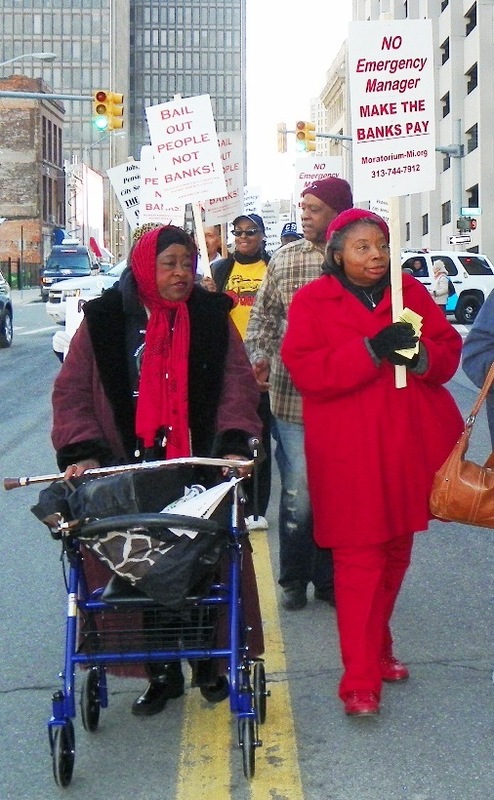 Senior city retirees protest bankruptcy plan at court April 1, 2014. In my view, the truth is the “bargain” is a subliminal deal to get state funding necessary to transfer the DIA and its art assets into others hands allowing it to spin off from the control of the City of Detroit and thus its people. The “bargain” also provides for a extreme reductions in benefits to those barely living and already sacrificing food for medicine. In short, it is a license to imprison and impoverish yourself. 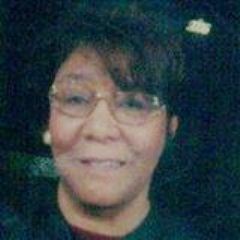 4th amended Disclosure Statement http://www.mieb.uscourts.gov/sites/default/files/detroit/docket4391.pdf. (P.S. thanks to Jamon Jordan for asking what the heck DGRS is. I should have spelled it out right at the beginning of the story, which I have done above–it is the Detroit General Retirement System, one of the city’s two pension systems. The other is the Detroit Police and Fire Retirement System (DPFRS). One Response to DGRS SELLS OUT; RETIREES, BARROW SAY ‘VOTE NO’ ON DETROIT BANKRUPTCY PLAN! I VOTED NO. I COULD NOT BELIEVE MY EARS WHEN TOLD 11’000 RETIREES DID NOT VOTE AT ALL!!!!! (3,000 VOTED NO, 6.000 VOTED YES) I CAN NOT REMEMBER THE LAST TIME I FELT SO UTTERLY HELPLESS. I FELT LIKE I WAS IMPLODING.